Feature: UK comedy series really had a golden age from the 70s to the mid 80s. There are so many classic series from this period that it boggles the mind. I always thought one of the darker ones was Porridge; a Ronnie Barker vehicle which had him cast as a prisoner in a very unwelcoming looking British jail. Although it was rife with some of Barker's funniest work, it still had that dark side of how much of a punishment life in jail is. 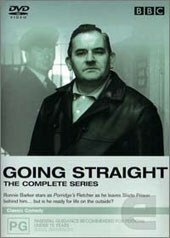 Porridge was a great series, full of some very colorful criminal characters and UK comedy talent and it spawned this short-lived series: Going Straight. Going Straight was definitely running off the steam of Porridge (awful pun not intended) as evident in the first episode which begins in his familiar cell and includes most of the characters from the original series too. Fletch (Barker) is finally out on parole after three and a half years at Slade Prison. From this point on he says he is "Going Straight", no more crime and is planning on becoming a valued part of society. From the opening episode the darker aspects start showing through, with lots of dialogue from the Prison Guards drumming into Fletch how hard life is outside, and that going straight isn't going to be nearly as easy as he thinks it will be. Once finally out Fletch finds much has changed and his family doesn't exactly welcome him back with open arms. Each episode is a tale of one more challenge Fletch faces and sometimes doesn't succeed at all at in his efforts to leave his criminal past behind him. The underlying theme of a lot of the series is the mass unemployment in Thatcher era Britain. It may have been topical at the time, but when watching now, it seems like its an obvious dig at the dissatisfaction the writers had at the situation in the country at that time. Sure, there are lots of laughs, this is first and foremost pure UK comedy, but it does have an edge, and its shown often. "Going Straight" only lasted one series (6 episodes), and its no real wonder why as it fails to offer avenues for a lot of new things to happen to Fletch after the many storylines he went through in Porridge. The recurring characters from Porridge add little to the storylines and do make it overly familiar. It almost seems as though the show was only designed as a one season series just offer closure for Fletch, more so than giving the character a fully fledged new series. When compared to the likes of other classic UK comedies from this era, like Fawlty Towers, The Young Ones, Only Fools and Horses, The Goodies etc, Going Straight fares relatively poorly. Its still very entertaining and a lot of the humor is still as funny as it was, but it's not in the same league as Porridge, or the series I mentioned. Audio: The audio is clean and easily understood, aside from some of the more extreme traits of Fletch's accent, but the audio itself is serviceable in its Dolby Mono mix. There are English subtitles included as well. Extras: BBC are reissuing these old comedy series like nobodies business these days, and like many of them, it shows. This is the definition of "Bare Bones TV Series Release". You get a menu and that's about it. A lot of people are happy enough just having their favorite shows on DVD instead of their tired old VHS recordings from the 80s, but DVD allows for so much more that its always a disappointment when you get a series that has no extra features whatsoever. Final Say: For fans of the golden age of UK comedy this isn't "must see" but it is worth seeing. For fans of Porridge its must have as it finishes the series off nicely, even if it gets a tad tired towards the end. The DVD isn't anything spectacular and does nothing to take advantage of the medium aside from including all 6 episodes on one disc.